Your customers are chiming in all the time on Facebook, Twitter and countless other forums, your buyers are posting their opinions about your products and services. To better serve them, build your brand, and protect market position, you want to know what's being said. 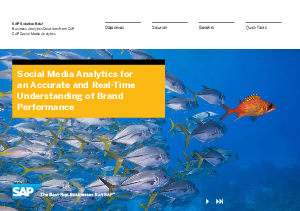 The SAP Social Media Analytics application by NetBase can help - by extracting customer perceptions from terabytes of social media commentary in real time. But how do you listen and understand? Read on to learn more.